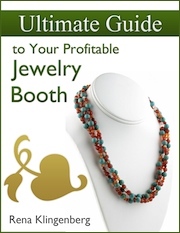 "The Ultimate Guide to a Profitable Jewelry Booth"
Rena Shares success tips, stategies and the secrets she has discovered through her years of selling her handmade jewelry at shows. The book is about 176 pages and retails for $39. Click on the book picture to pick you copy up now.